Young Tiger NTR’s prestigious 25th film in the direction of Sukumar, Nannaku Prematho, has entered the last leg of its shooting part. Today, the unit members kickstarted the film’s penultimate schedule. A song and several important scenes will be shot in this schedule and on the 22nd, the unit will leave for the Spain schedule. The Spain schedule will commence from the 24th of this month and the shooting will be wrapped up by 10th December. With this, the entire shooting part will be completed. Already, the post-production work is going on simultaneously. 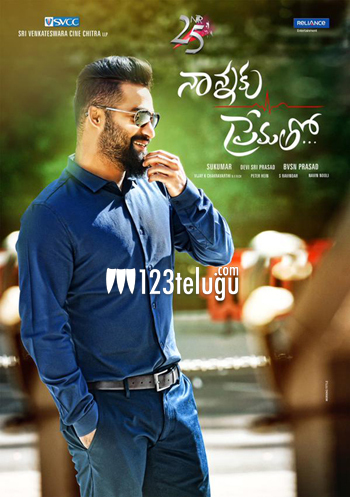 Nannaku Prematho’s audio launch event will be held in December and the film will hit the screens during the Sankranthi festive season. The film’s teaser, which was released as a Dasara treat, has broken all the existing records on YouTube and it is now the most ‘watched’ and ‘liked’ Telugu film teaser on YouTube.